Imagine 20 Tamil boys and girls stood in a circle in the sand under the shade of a Banyan tree, all with beaming smiles and raring to workout. 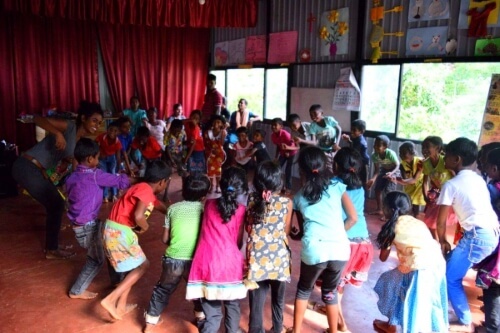 Except these boys and girls aren’t your usual Torontonian kids, but resilient survivors of war, disaster and poverty in Sri Lanka, and the circle is a roda, the circle of energy and camaraderie that starts off every Capokolam class. Imagine if 20 Tamil boys and girls stood in a circle in the sand under the shade of a banyan tree, all with beaming smiles and raring to work out. Except these boys and girls aren’t your usual Torontonian kids but resilient survivors of war, disaster and poverty in Sri Lanka. And the circle is a roda, the circle of energy and camaraderie that starts off every Capokolam class. In the background, the sounds of African percussion instruments fuse with Tamil classical music. These 20 are some of the over 200 incredible and resilient young Sri Lankans that Capokolam has been reaching out to for the past two summers, and there are many more they hope to reach out to this summer. Capokolam was created by a group of young professionals to help bring lasting change to marginalized communities in Sri Lanka. Two years later the charity is still going on strong. At the helm are two young Tamils, Priya and Vino, whose family fled the Sri Lankan civil war to Toronto in the 1980s. Priya has taught in the refugee camps of Palestine and throughout the Middle East. Her experience raised a burning question about how to bring people together in solidarity with communities in Sri Lanka and deliver something extraordinary to help those in need. The answer was Capokolam's educational arts programs. 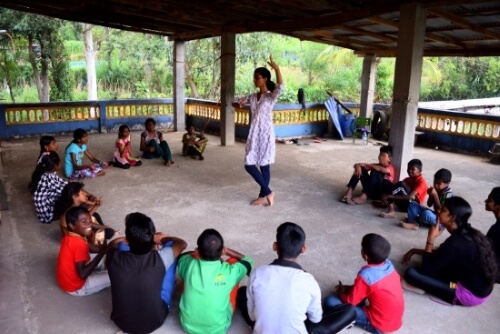 Capokolam's team of volunteers deliver a holistic arts program that includes Capoeira, traditional and indigenous art, English language, bharatanatyam and sports, and allows volunteers a space to teach their own skills or art where it matters. The programs aim to raise self and cultural awareness, develop confidence and emotional intelligence, help to deal with trauma positively, and give children tools to use in their everyday lives. Last year, 21 volunteers from university students to professional dancers, psychotherapists and artists signed up to join the organization. After meeting in Colombo and Batticaloa, volunteers traveled to the hill country and Eastern province to deliver a three week program. For the children and everyone involved, the positive impact on the children's confidence and skills and the incredible feedback was completely unexpected. As one volunteer remarked, "what you learn about life and perseverance from the children is life changing." Priya, Vino and the Capokolam team are appealing for volunteers and support from inside and outside the Tamil community. "For August 2017 we need your help as volunteers and with donations and fund-raising to take the program island-wide." Capokolam is looking to bring together as many volunteers as possible this year. If you think you can help with this amazing project by volunteering, donating, sharing, or holding your own fundraising event, find out more at www.capokolam.org, www.facebook.com/capokolam, or email Priya, Vino and the team at contact@capokolam.org.